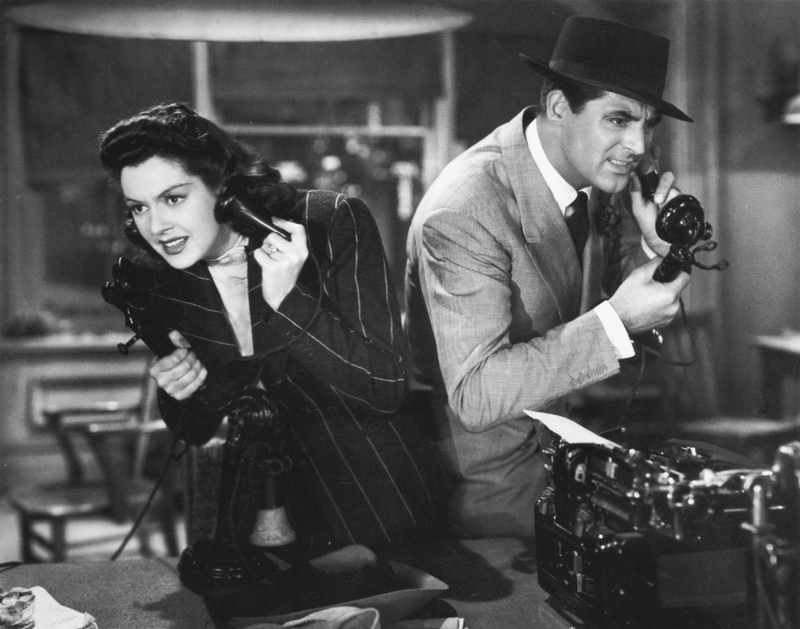 Cary Grant and Rosalind Russell in His Girl Friday, 1940. The newspaperman – the cliché is that anyone working for a paper is a rogue and a joker, a cross between hero and raconteur, and possibly drunk at that. It’s the kind of character made famous by The Front Page (1931) and His Girl Friday (1940), and usually played by someone as charming and suave, as Adolph Menjou or Cary Grant. 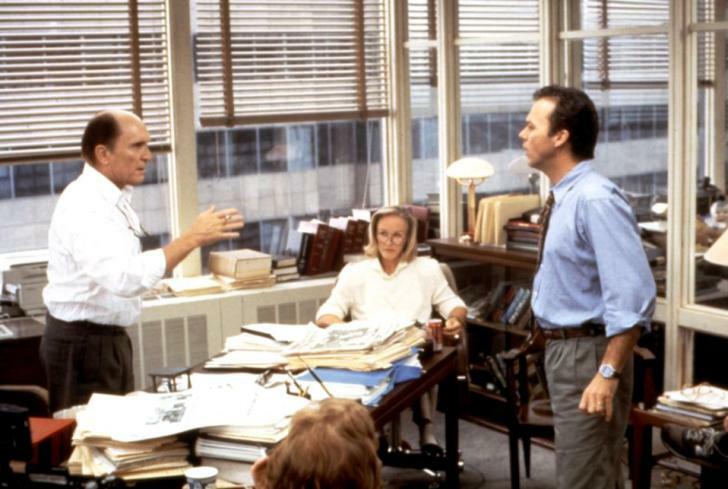 Robert Duvall, Glenn Close, and Michael Keaton in The Paper (1984). 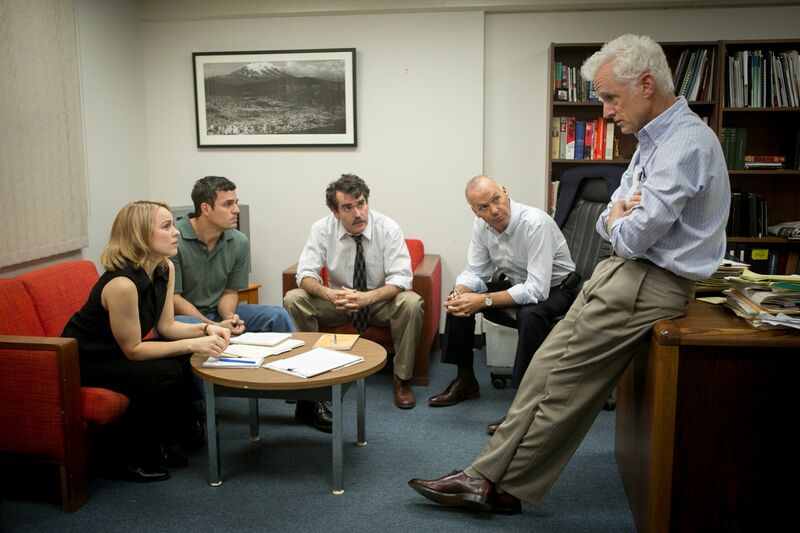 Rachel McAdams, Mark Ruffalo, Brian d’Arcy James, Michael Keaton and John Slattery in Spotlight (2015). Half a century later, the tireless and selfless heroics of Carl Bernstein and Bob Woodward in All The President’s Men (1976) managed to make knocking on doors and talking on the telephone still seem noble and glamorous. But less than 20 years after that, Ron Howard’s all-but-forgotten The Paper (1994) is a nostalgic curio, out of touch and out of date. Journalism hasn’t been the same since newspapers gave way to television and then the Internet. In 2015, Tom McCarthy’s Spotlight – winner of this year’s Oscar for Best Picture – was just as old-school and even less glamorous, and for once felt more real than anything else based on a true story (or to put it another way, “ripped from today’s headlines”). Journalists are uniquely positioned in popular culture. Fictionally, they usually serve as detective figures, looking for a story or the missing facts, and through investigation and skill they uncover hidden motives and dark secrets, exposing all manner of wrongdoing for the general good. Their characters are often loners, cast apart and preferring it that way. They serve to restore law and order and, because of their higher purpose, seem above the law. All they want is the truth, and they’ll sacrifice liars, politicians and even their own careers for justice. But the portrayal of the journalist is also sometimes much more complicated. 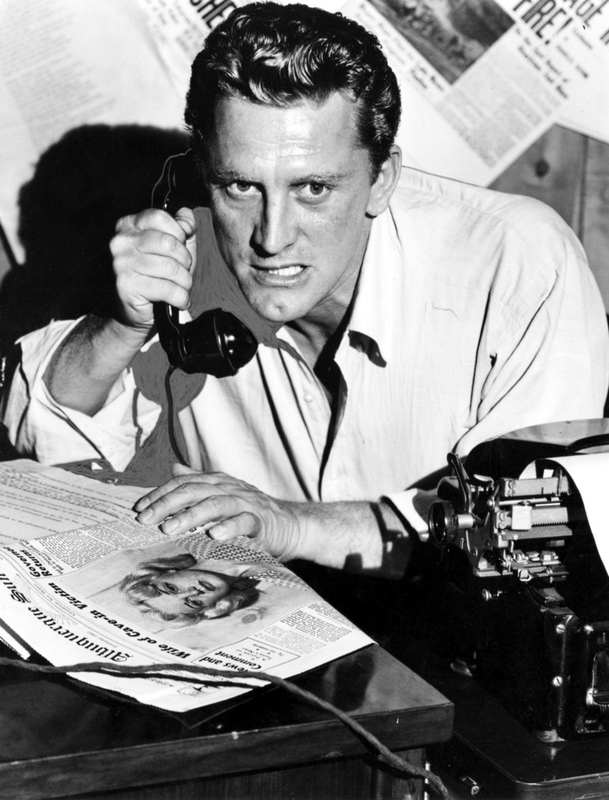 One remembers that Billy Wilder’s 1951 drama Ace In The Hole (tellingly, also titled The Big Carnival) suggested some reporters might prefer the innocent victim stay in the hole a couple of days longer to keep the story on the front page. Haskell Wexler’s Medium Cool, following actor Robert Forster during the Chicago Riots in 1969, perfectly represented the political and professional paralysis reporters may ultimately face. 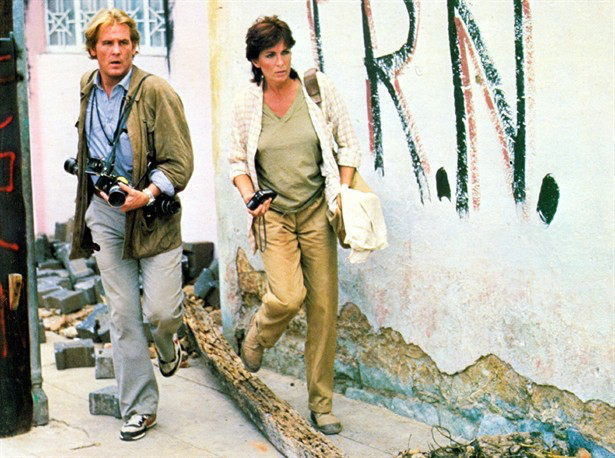 By the mid-’80s, the political ramifications reverberated far past just “getting the story” in films such as Oliver Stone’s Salvador (1986) and Ron Shelton’s Under Fire (1983), the latter having Nick Nolte faking his own news photos to change the outcome of the Nicaraguan revolution. The increasingly cynical feeling that the press can’t be trusted reached its logical conclusion in Wag The Dog (1997), a strikingly plausible demonstration of how easily the public – and the press – might be manipulated for the sake of politics. 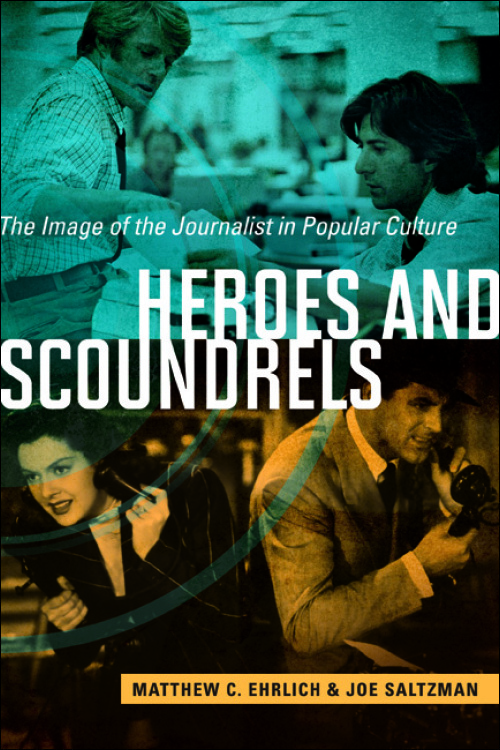 Heroes and Scoundrels: The Image of the Journalist in Popular Culture (University of Illinois Press), a new book by Matthew C. Ehrlich & Joe Saltzman, goes a long way to tease out the celebratory, contradictory and satirical ways people who report the news have been depicted on film, TV and in video games. Thematically, the topic is rich – there are hundreds of examples to draw from to create a narrative of how culture “reports” on the reporters. Journalism, and how journalists function within our culture, changes with the times. But the authors don’t go chronologically through the corpus. Instead, they trace themes jumping forward and backward, starting from a history of the profession and then picking specific topics. They discuss how journalists treat the wars they’re covering, and how the films treat the war correspondents themselves (from Ernie Pyle in The Story of G.I. Joe to Private Joker in Full Metal Jacket); they investigate sexual and racial differences in representation and how that affects the reportage (Rosalind Russell taking over the originally male role of Hildy Johnson in His Girl Friday; Jason Blair’s race complicating the accusations of plagiarism in CQ/CX, Gabe McKinley’s 2012 play; and Truman Capote’s coded homosexual attraction to Perry Smith in both Capote (2005) and Infamous (2006)). They also devote a chapter to tracing the obsession with image, which rose in the 1960s with the rise of “professional” newscasters on TV (skewered best, if affectionately, in 1987’s Broadcast News). Holly Hunter, William Hurt, and Albert Brooks in Broadcast News (1976). From hard-boiled newspaper reporters to gossip columnists to television iconoclasts to online bloggers, how we get our news and the real agendas of the people behind it are as diverse as the number of films on the subject. In a way, that’s part of the problem; it’s a dense tangle. Heroes and Scoundrels can’t help ending up more like a survey than any definitive summation or treatise. In a note on “image,” for example, the writers cite films ranging from the acerbic Ace in the Hole (a pitch-dark character study) to Broadcast News (which is really a romance). While both toy with the anxiety we feel about how news is manufactured, they’re too much fun to be taken too seriously as clarion calls that changed the course of how journalists were depicted. 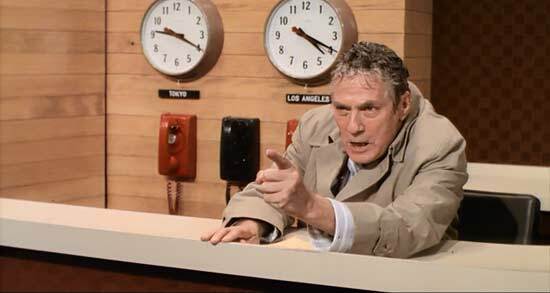 Peter Finch goes nuts in Network (1976). Films depict everyone from cub reporters to publishers, from photo journalists to lonely-hearts columnists. They all reflect the so-called Fourth Estate – how reporters try to arrive at the truth about our world. This diverse genre of film represents the culture thinking about itself – how it keeps itself in line; whom we allow to do such an important job; how we make sense of everything from crime to politics to corruption; and of course, how often they intersect with each other. 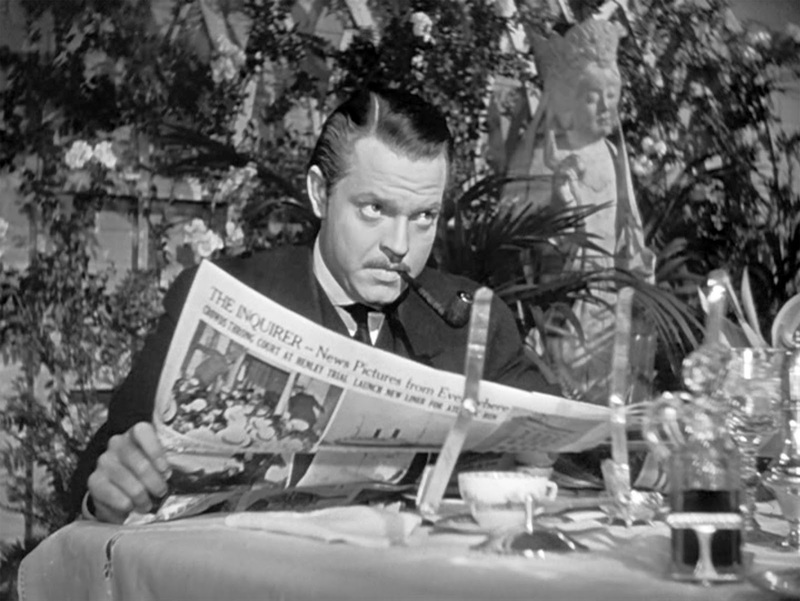 Orson Welles as Citizen Kane (1941). The most interesting aspect of the book is how the same story changes depending upon where we are. During the ’70s, in the wake of Watergate, films increasingly questioned whether the press could equally serve the truth and the citizenry. All the President’s Men aside, we have Network (1976), which lambastes the inside players as victims of their own corrupt and intractable system, through to The Insider (1999), which asserts that the press, regardless of how well-meaning it is, still destroys its star witness to get the story. The anonymous reporters in Citizen Kane (1941) are resurrected in Todd Haynes’ Velvet Goldmine (1998), whose structure is modeled closely on Kane’s. But Velvet foregrounds the protagonist reporter who, while looking into the mystery behind the death of a famous singer while negotiating ’70s glam-rock culture, comes out as bisexual. Frank Langella and Michael Sheen in Frost/Nxon (2008). The Heroes authors cite Frost/Nixon as an exemplar of our anxiety about the press struggling to remain relevant as history passes it by. 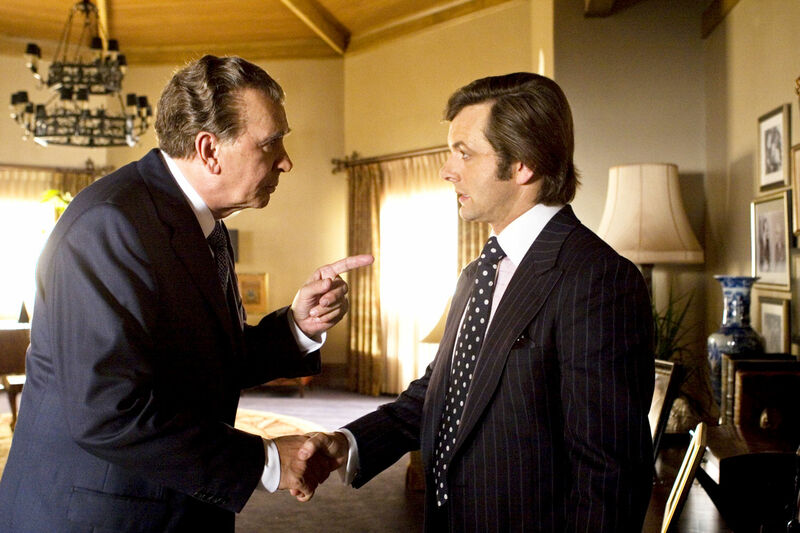 Coming 30 years after the events depicted, the metaphor of Nixon trying to restore his status as a “great man” by agreeing to a public interview, while David Frost conversely seeks to elevate his non-serious image by grilling a dishonored president, could only be conceived and appreciated once we recognize that news is personality-driven. The press person becomes his own kind of caricature, as in the Hunter S. Thompson-inspired pseudo-psychedelic Where The Buffalo Roam (1980) and Fear and Loathing in Las Vegas (1998). This isn’t a reporter; it’s a clown. When the sexual icon Emanuelle (Laura Gemser) plays a journalist in 1976’s Emanuelle in Bangkok, you know the template is approaching parodic breaking point. Nick Nolte and Ed Harris in Under Fire (1983). A new cycle in the 20-aughts involving recent plagiarism scandals and personal corruption of some writers extended the wrong-thing, right-reasons of earlier films like Under Fire, but painted the protagonists in more damning (but strangely sympathetic) shadings. Although shamed, some of these scoundrels make for great drama: 2003’s Shattered Glass with Hayden Christensen as disgraced writer Stephen Glass; 2006’s The Hoax, with Richard Gere as Clifford Irving. Ehrlich and Saltzman’s book doesn’t quite identify it, but concurrent with the rumored death of journalism in the 2000s, the movies are marking a decadent baroque period depicting journalism’s death throes. There are no more Walter Cronkites, and all the name journalists are now changing allegiances as often as competitors offer to increase their salary. Presidential candidates don’t need to conduct interviews or participate in debates; they depend on social media. We’re at or near the endgame for meaningful discussions of journalists. The end of an epoch, and the book couldn’t go on much longer to better make that point. While Heroes and Scoundrels was published in 2015, 2014’s Nightcrawler didn’t make the cut. What would the authors have made of its dark vision of celebrity journalism, the polar opposite of the Oscar-winning Spotlight? They both seem almost redundant by this point, the two extremes of an embattled profession we already know by heart. 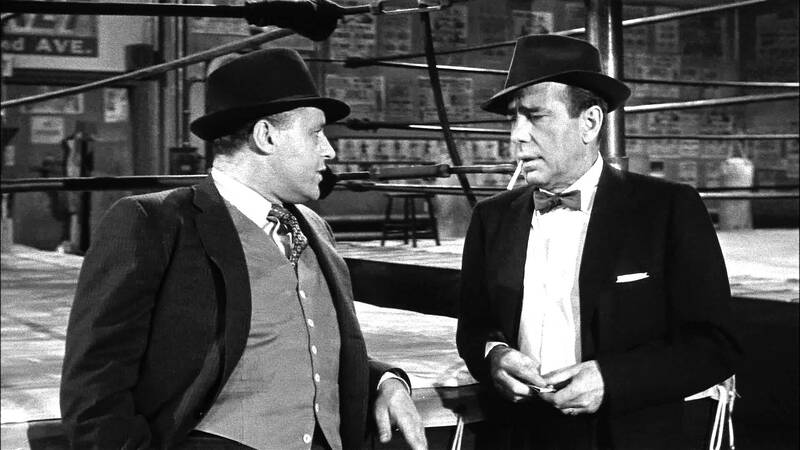 In the exemplary The Harder They Fall (1956), Humphrey Bogart plays an alcoholic reporter who finds himself involved in the very corruption of the boxing world he set out to expose. Budd Shulberg wrote the source novel and, after having written the cynical Hollywood classic What Makes Sammy Run? in 1941, he should know better than most how easy it is to fall prey to a good story at the expense of the truth. After reading this dense, although fascinating, book, I finally realize most of these stories about people reporting the news are really about people reporting about themselves. Heroes & Scoundrels can be purchased at Indiebound and Amazon. A frequent contributor to EatDrinkFilms, Roger Leatherwood worked in all levels of show business over the last 20 years, from managing the world-famous Grand Lake Theatre in Oakland to projecting midnight movies to directing a feature about a killer, Usher (2004), that won numerous awards on the independent festival circuit. 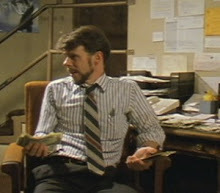 He currently works at UCLA managing the instructional media collections, which to him is its own kind of show business. His film writing has appeared in numerous publications, including Bright Lights Film Journal, European Trash Cinema, and his blog mondo-cine. Last week, Roger interviewed Joe Saltzman for EatDrinkFilms. Watch a 21 minute montage of clips of journalists in film and television. Watch an hourlong Q & A with Joe Saltzman. This entry was posted in Columnists, Films, Films: Book Reviews and tagged Heroes and Scoundrels: The Image of the Journalist in Popular Culture, Joe Saltzman, Roger Leatherwood. Bookmark the permalink.